A source defines a set of connector parameters specifying where and how to crawl Active Directory in a given domain. The Coveo connector for Microsoft Active Directory uses the Lightweight Directory Access Protocol (LDAP) to read Active Directory content. The connector performs an LDAP search to find all the items to index. Select the connector used by this source. In this case, select Active Directory. The list of LDAP URIs indicating the starting locations to index, one entry per line. Important: In the LDAP URLs, you must enter the keywords (LDAP, OU, DC...) in uppercase. If you created a custom document type set for this source, select it (see Creating a Document Type Set). Time interval at which the index is automatically refreshed to keep the index content up-to-date. By default, the recommended Every day option instructs CES to refresh the source everyday at 12 AM. 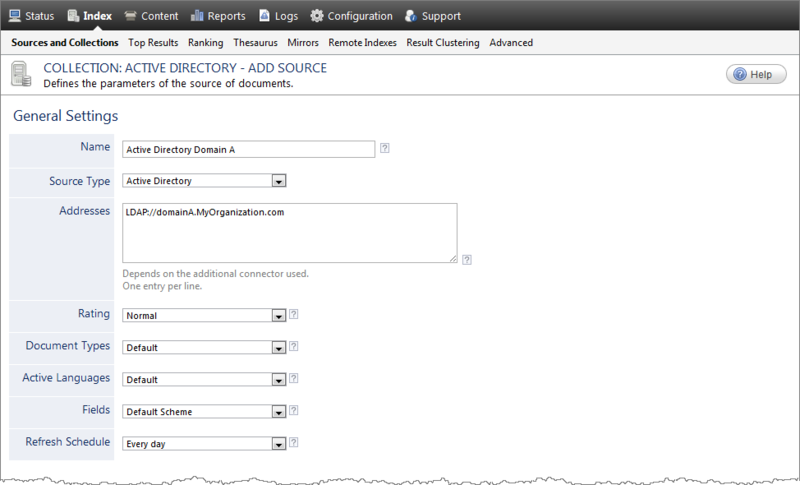 Note: You can create new or modify existing source refresh schedules (see Creating or Modifying a Source Schedule). Determines the time interval in seconds between incremental refresh updates (see About Incremental Refresh and Live Monitoring). The default and recommended value is 3600 seconds (1 hour). The filters used to refine the LDAP query to Active Directory. You typically want to crawl all the users in Active Directory. Depending on the configuration of Active Directory, you may find that unwanted users are crawled. The default value is mail=*. It allows to get all users that also have an Exchange Mailbox. Note: The connector includes a built-in hidden filter: (&(objectclass=user)(objectclass=person)). This is a logical AND operation that finds users that are real persons, eliminating other mailboxes. The filter you enter in LDAP Filters is added to the AND operation of the built-in hidden filter (ex. : (&(objectclass=user)(objectclass=person)(mail=*)). Click Add Parameter when you want to show advanced hidden source parameters. Check to index all subfolders below the specified starting addresses. Selected by default. Leave the check box cleared. This parameter needs to be checked only in rare cases for case sensitive systems in which distinct documents may have the same file name but with different casing. When you select this check box (recommended), at indexing time CES creates HTML versions of indexed documents and saves them in the unified index. In the search interfaces, users can then more rapidly review the content by clicking the Quick View link to open the HTML version of the item rather than opening the original document with the original application. Consider clearing this check box only if you do not want to use Quick View links or to save resources when building the source. Leave this check box cleared (recommended) so that in the search interfaces, the main search result link opens the original document with the original application. Consider selecting this check box only when you do not want users to be able to open the original document but only see the HTML version of the document as a Quick View. When this option is selected, you must also select the Generate a cached HTML version of indexed documents check box. In the Security Provider drop-down list, select the default, modified, or new Active Directory security provider that want for this source (see Configuring an Active Directory Security Provider). In the Authentication drop-down list, select the user identity that you selected for this source (see Adding a User Identity). Click Save and Start to save the source configuration and start indexing this source. Add the collection containing this new source to the scope of desired search interfaces (see Configuring the Scope of a .NET Search Interface).